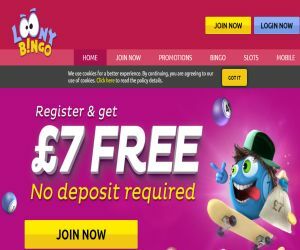 Loony Bingo's New Wacky Welcome | Play Today with a £30 bonus! You better get your skates on! As Loony Bingo has unleashed a brand new wacky welcome offer! If you're looking for the craziest time online, then you've come to the right place! And there's no better time to try Loony Bingo than now! That's because the outrageously entertaining Cassava site is ready to spoil you with a wacky new welcome bonus blaster! When you rock up to the insane site, you'll be welcomed by an lovable gang of animated game ball creatures with crazy eyes and crazier tongues! If that's not enough to catch your attention, then all you have to do is sign up, and Loony will instantly credit your account with a FREE £7 no deposit Welcome bonus! You can also enjoy 2 full days of Free bingo, with no deposit required! That's not all folks, as when you deposit your account with £10, you can catch a crazy new £30 bonus, to jump-start your outrageous adventure with £40. It's up to you to decide which insane games you want to spend your Free cash on! From the bonkers bingo, live bingo, stunning slots or cool casino, table and instant gaming hits, the possibilities are endless! While you enjoy the unstoppable entertainment, you'll also be treated to wild bonuses, cashback from day one, weekly jackpots and the chance to become a £1 Million in Self Made Millionaire every month! Feel The Fresh Breeze Coming From Aloha Slots!